(Nanowerk News) As a leader in precision motion control solutions, PI (Physik Instrumente) introduces the A-60x MTT, stainless steel multi-axis top that combines with its offerings of PIglide rotary air bearing stages and platforms. Air-bearings have no rolling or sliding elements and deliver completely frictionless, non-contact motion, resulting in negligible hysteresis or reversal error, better geometric performance, and velocity stability, which are ideal prerequisites for high-end industrial inspection and manufacturing operations. 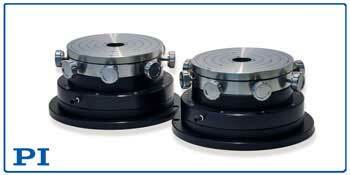 Multi-axis Platform for Rotary Air Bearings, A-60x MTT. Mounted to rotary air bearings to provide manual adjustments in X-Y-tip-tilt, the A-60x MTT enables the perfect alignment of a payload to the bearing’s axis of rotation. Constructed from durable, wear-resistant stainless-steel with table diameters from 75mm to 300mm and a clear aperture, this accessory is ideal for metrology, roundness measurement, and part gauging applications as passive rotary air bearings are designed for accuracy, precision, high stiffness, and ease of use, in any orientation, and are easily integrated with motors and encoders for complete positioning solutions. PI designs and manufactures all air bearing products in the USA. PI’s engineering team has more than 200 man years of air bearing design experience. In addition to customized systems for OEMs, PI offers a substantial standard product line of air bearing stages that includes motorized and non-motorized, linear, rotary, spherical, X/XY, voice coil, compact, and large scale systems, as a complement to its comprehensive range of piezo nano positioning stages, traditional motorized positioners and hexapod 6-axis parallel positioning systems. The air bearing technology and engineered systems capabilities puts PI in the unique position to cover the whole motion range from finger-tip sized nano-positioners to large scale stages with long travel ranges, through a plethora of different drives and guiding systems that can be tailored to meet the needs of an OEM or customer. PI is a leading manufacturer of air bearing stages, piezoelectric solutions, precision motion control equipment, and hexapod parallel-kinematics for semiconductor applications, photonics, bio-nano-technology, and medical engineering. PI has been developing and manufacturing standard & custom precision products with piezoceramic and electromagnetic drives for 4 decades. The company has been ISO 9001 certified since 1994 and provides innovative, high-quality solutions for OEM and research. The PI group employs more than 1,000 people worldwide in 15 subsidiaries and R&D / engineering centers on 3 continents.